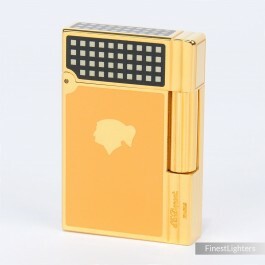 S.T.Dupont Cohiba Gatsby Lighter is dedicated to the most famous cigar brand in the world: Cohiba. The lighter is finished in gold and is decorated with dark-yellow Chinese lacquer. On the lighter is depicted a golden Taino Indian head, the symbol of Cohiba, and the lid is decorated with the same black-and-white squares motif as Cohiba cigars' band.